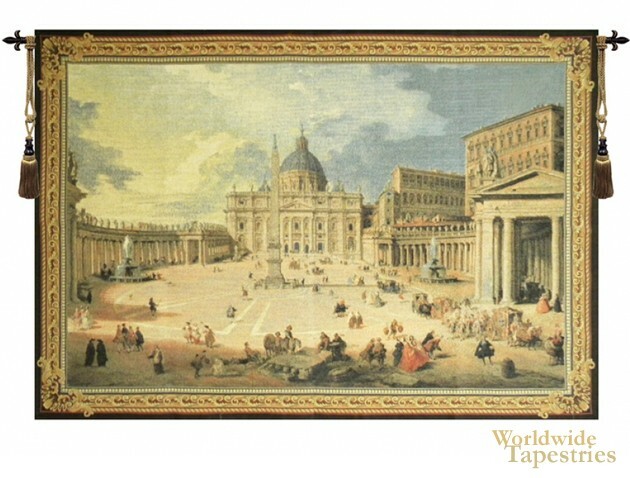 In St Peter Square tapestry we see the scene of the town square in front of St. Peter's Basilica in Vatican city. The architecture is beautiful and the people and their horse and carriage is from the past as this city square represents the hub of activity and social gatherings. At the center is an Egyptian obelisk erected in 1586. The surrounding curved arrangement of columns or colonnades and all buildings surrounding it creates the amazing open space in the center. This St Peter Square tapestry is backed with a lining and a tunnel for easy hanging. Note: tapestry rods and tassels, where pictured, are not included in the price.